More classes with Julie to be posted soon! 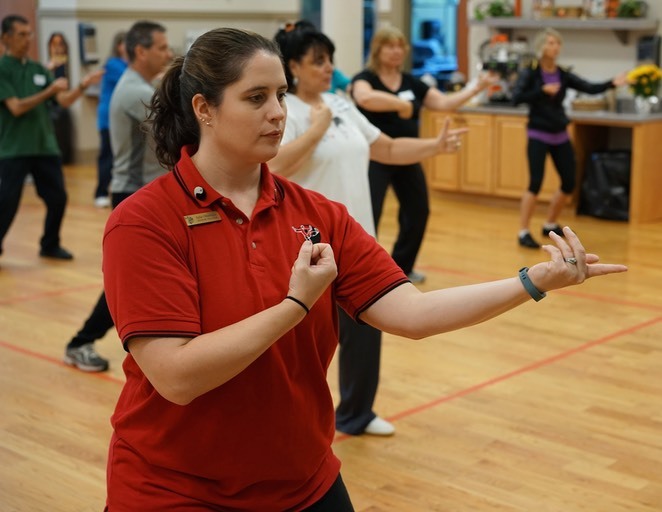 ﻿Julie Oberhaus﻿ is a ﻿﻿Master Trainer﻿ with the Tai Chi for Health Institute﻿ and has been teaching tai chi for over ten years. She has completed several certifications in Dr. Paul Lam’s Tai Chi for Health programs including Tai Chi for Arthritis, Depth of Tai Chi for Arthritis, Tai Chi for Diabetes, Depth of Sun 73, Tai Chi for Energy, and Tai Chi for Beginners. She enjoys working with others as she continues to deepen her understanding and knowledge of tai chi through these and other forms such as fan, cane, Chen, Yang, as well as silk reeling and qigong. Julie graduated with honors from Bowling Green State University with a Bachelor of Science in Education (emphasis in modern dance) and a minor in psychology. Julie is currently teaching several tai chi classes in her community. She also enjoys teaching and hosting a variety of tai chi workshops, instructor certification courses, and skill builder sessions. She is excited to share Tai Chi for Health programs with New England. It is Julie’s goal to have people of all ages enjoy the benefits of tai chi.